I tested a lot of molten cakes. I’ve eaten even more. It’s one of my favorite treats. Ooey gooey chocolate? How can I pass that up? Typically, I can’t. When you’re gluten-free or vegan or both, you get used to compromising on food. You skip dessert, you miss out on the treats. Most people don’t normally use gluten-free flours, or skip the eggs and dairy. And when they do, you can taste it. I made this cake many times, making tiny adjustments, making everyone I know eat it, until no one knew that I was giving them a gluten-free, vegan molten cake. They just thought they were enjoying an amazing molten cake. That’s when I call a recipe done – or ready to post at least. I tried to make this molten cake fail-proof by splitting the chocolate. Some is in the batter and some is in the center. This ensures a molten center. 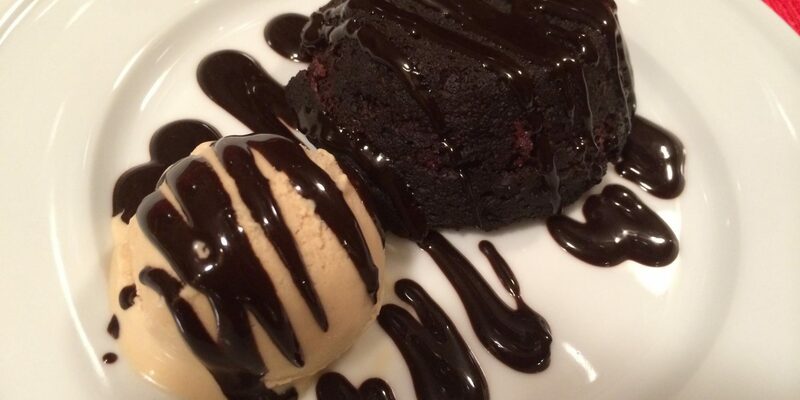 There’s nothing worse than the promise of a molten cake and receiving a chocolate cake that’s baked through. Where’s my ooey gooey center? The melted chocolate in the center should guard against this unhappy accident. You still have to bake this baby right though. 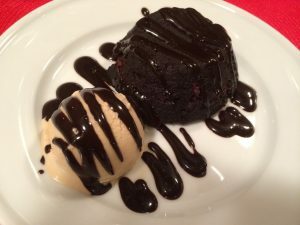 The melted chocolate gives you a little more room in the baking time, but you can’t over bake your cakes by 5 minutes and expect a molten center. Bake them until the sides feel set, but the center still jiggles a little. I prefer a silicone mold because they are easy to flip and unmold. They also bake a little quicker. I set my silicone molds on a pizza grate, which also allows them to bake quicker and more evenly (as opposed to baking on a sheet pan). Even if you use ramekins I would set them on a pizza grate or right on your oven racks. I find that sheet pans block the heat and change the baking time. When you heat the chocolate, Earth Balance, palm sugar, etc. together, heat on low heat so you don’t overheat the chocolate. Heat until all ingredients are melted and sugar is dissolved. Fold the flour and sour cream or yogurt in gently. Don’t beat up this batter. We need to keep as much air in it as possible. I love the flavor of raw cacoa powder. Plus, it’s all natural. But you can always substitute natural cocoa powder (not dutch-processed) for raw cacoa powder. It’s important to use the right cocoa powder in recipes because natural cocoa powder and raw cacoa powder need baking soda for leavening. Dutch processed cocoa powders require baking powder. If you mindlessly swap one cocoa powder for another without adjusting your leavening agents, your cakes come out sad and low. In other words, they will have leavening issues. Just follow the recipe below and you shouldn’t have any problems! Top these rich and gooey cakes with Killer Dairy-free Fudge Sauce and Paleo Caramel Sauce! I make them with my AP Gluten-free Flour Blend. Grease and flour 8 ramekins or silicone baking cups. Set aside 2 ounces of chocolate to melt, chop the other two ounces. Melt Earth Balance, 2 oz of chocolate, sugar, milk, and vanilla together. Remove from heat snd stir into dry ingredients. Fold in sour cream or yogurt. Fill ramekins halfway with batter. Evenly distribute rest of chopped 2 oz. of chocolate into each ramekin. Cover chopped chocolate with remaining batter. Set silicon molds or ramekins on a pizza grate or directly on oven racks. I use a pizza grate. Bake for 12-16 minutes at 350F. I find the time varies depending if I bake in silicone baking cups or porcelain ramekins. Bake until sides are set and center still jiggles. Remove from oven. Serve immediately. If in a silicone baking cup flip upside down onto serving plate to unmold. If in a ramekin, you can serve right in the ramekin or try to flip and unmold. Serve with Killer Dairy-free Fudge Sauce or Paleo Caramel Sauce.